Firebird Peak is the unofficial name of the highpoint on the ridge of the same name that descends off the north side of Norman Clyde Peak in the Palisades. 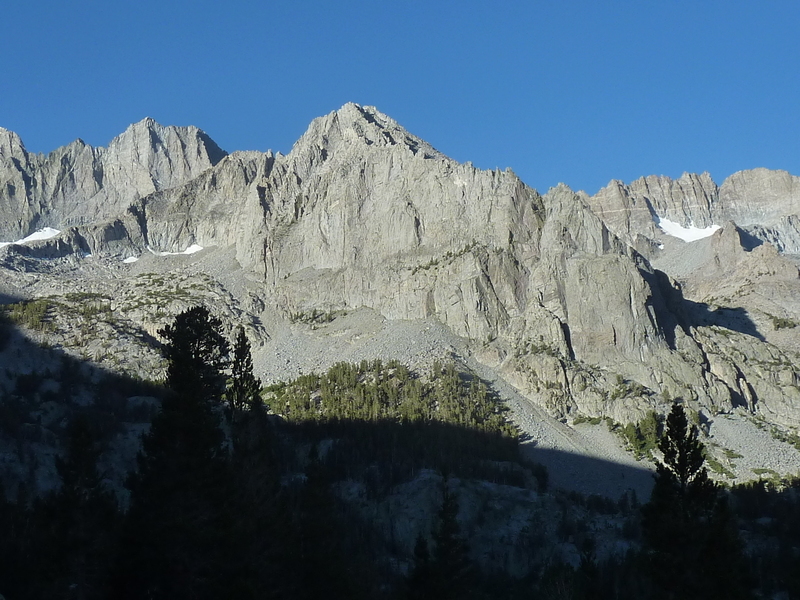 It offers a fine, up-close view of Middle Palisade, Norman Clyde Peak and Mt. Williams along with the impressive, but receding glaciers at the base of their northeastern faces. It was expected to be a fairly tame day by Challenge standards and as such there was a significant turnout at the South Fork Big Pine TH, 17 in all for the 6a start. Having joined us, Chris Henry recalled the tale from the previous night when he, Iris and Matt ended up at Bishop's Dennys in the wee hours of the night after a late return from Potluck Pass. We were all rooting for Iris to finish the Challenge as only the second woman to do so, but her whereabouts were currently unknown. As is standard Challenge protocol, no one gets special treatment, however, and we were off at usual start time. We followed the South Fork Trail for about 4mi up the main drainage with the 1,000-foot climb up the switchbacks at the headwall, past Willow Lake and on to its terminus at Brainerd Lake. Having been up this way something like 4-5 times in the past, I knew there was a shortcut to bypass the last 1/3mi to the lake. I wasn't keeping up with the front group today but managed to catch them a little by surprise when I took the shortcut starting up from the small pond where the trail starts a short downhill after turning to the east. I reconnected with the leaders in the steep slopes below Finger Lake, surprising a few of them. We reached the end of the use trail in the forest at Finger Lake just before 8a. There are numerous campsites here, once home to the Palisades Outdoor School of Mountaineering that used to run courses and guide clients in the area, this being one of their popular base camps. After crossing the lake's outlet, we had less than a mile to go to reach our summit, the cross-country section naturally leading us up to its East Ridge in a wide arc. The scrambling was better than I expected, mainly because our previous visits took us over the unpleasant, loose moraine under the glaciers on our way to peaks along the crest, but here the rock was more solid and enjoyable. With Sean O once again leading the way, it took less than three and a half hours to reach the summit. The register appears to be quite busy for an obscure peak. The oldest entry on a loose page was from Ed Lane in 1966. Gordon and Barbara left a small notebook in 1982 (it was Barbara's second visit, having previously climbed it with Smatko in 1973) that seems to have garnered a number of entries from those who failed on Norman Clyde Peak for various reasons, Firebird acting as the consolation prize. As we expected, the views were grand, sweeping across the Palisades, the hard ice of the exposed glaciers glistening in the sun. We waited long enough to gather six of us at the summit - Sean O, Sean R, Scott, Gavin, Eric and myself, Sean O entertaining us with his ritual summit snack of canned sardines. The register had mentioned finding an older Hervey Voge one from 1937 at the lower north end of the ridge, but that wasn't enough to entice any of us to consider following the tortured ridgeline in that direction to see if it was still there. Instead, we decided to head back down, though a few lingered longer at the summit to relax, enjoy the views more and wait for some of the others to show up. Descending with Sean R and Scott, it didn't take long to start running into the others. Mason and JD were the first, just ten minutes below the summit, then Patrick, Ken, Ning, Jim and others in succession over the course of the next hour, most of them somewhere on the East Ridge. We were back to the trail and just about to start down the switchbacks at the headwall when we unexpectedly came across Iris around noon. She had opted for sleep and then more sleep, not starting from the TH until 10:30a, well past everyone else. Luckily for her this was a short-ish day and she'd be able to get back before dark to catch up on rest. The eight days were taking their toll and she exuded her tired state, but still managed with a smile. I had to wonder if she was still smiling after we parted. In any case, no one could question her determination to see this through.